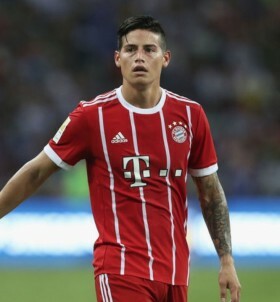 Bayern Munich attacker James Rodriguez is reportedly prepared to snub advances from the likes of Arsenal as he has no interest in pursuing a Premier League move. The Colombian is nearing the conclusion of his two-year loan spell with Bayern Munich and he is thereafter expected to return to parent club Real Madrid with the Bavarian giants holding no interest in securing a permanent deal. According to Marca Clara Colombia, the attacker is likely to part ways with the reigning European champions, but that may not necessary tempt him to head to the Premier League. It is added that Juventus could be an option for the former Monaco man with Cristiano Ronaldo in particular said to be keen on a reunion after their time together at the Bernabeu. Juventus have recently bolstered their attack front with the pre-contract signing of Aaron Ramsey ahead of the summer but they could yet make an approach for Rodriguez, given Paulo Dybala's future with the club remains under question.